Many couples are enjoying better sleep thanks to the popular trend of snore rooms. Loud snoring has long been a cause of restless nights and extra strain on relationships and marriages. Snoring couples not familiar with, or not able to use anti snoring devices usually sleep apart. Lying next to a chronic snorer while trying desperately to get to sleep is a particularly torturous event. If this is happening night after night, it can become completely unbearable. A snore room is essentially a second master bedroom that is conjoined with the main bedroom but is completely separate. This allows a couple to be close to each other at night, but far enough away (and through a thick enough wall) that the snoring of one doesn’t disturb the other. They offer a more pleasant alternative to the spare room at the other end of the house or the uncomfortable sofa in the living room. There are many treatments for snoring including positional therapy, nasal strips, humidifiers and anti-snoring sprays. Unfortunately, some people can try all these remedies to absolutely no avail. Kay Gallagher, Sleep Council, says, “Certainly when people sleep in a bed on their own they do tend to get a better night’s sleep. 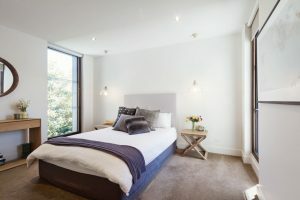 The problem with conventional houses is space doesn’t often permit this.” When downsizing the home or moving into over 50s/60s communities, it is becoming increasingly popular for retirees to specifically look for houses or suites with a snore room. For this reason, developers and architects are now designing rooms with joining master suites to meet this demand. Snore rooms are a healthy way to deal with the issue of snoring. For some, the thought of having their own bed, and not having to worry about being woken up by noise or restless sleepers is an incredible luxury. Others can be understandably concerned that moving into a separate room from your partner could negatively impact the relationship or lead to distance and intimacy issues. However, snore rooms seem to have incredibly positive influences on the relationship. Having a snore room ensures you get a better sleep and reduces tension in the relationship. When you do decide to join each other in the same bed, it is extra special. Snore rooms initially began as a luxury home trend for wealthy couples that could afford to renovate or buy for this specific purpose. It is now becoming quite commonplace among more modest income households as well. This makes sense considering that an estimated 1 in 4 couples sleeps separately. If buying a new house isn’t in your budget, you could renovate or redecorate a spare room or basement space to be a more comfortable, permanent sleeping space. What does lack of sleep do to you? Lack of sleep has many negative impacts on your health and wellbeing. Our bodies need sleep to recover from a busy day and to carry out basic functions. When we sleep we release hormones that control and regulate our appetite and metabolism. Not enough sleep can also increase your production of cortisol, the stress hormone. It also reduces your coordination and ability to perceive and judge things correctly. Memory loss is a common symptom of sleep deprivation as is irritability, disorientation, and high blood pressure. You can also be more susceptible to illness and infections. A snore room is a great solution to snoring-related tiredness. Snore rooms can be useful for more than just escaping from a noisy partner. If one of you is a light sleeper or tosses and turns in the night, a second master bedroom can be just as handy. Perhaps you have very different natural sleeping habits, as many couples often do. You might prefer to stay up later and read or watch television in bed, but your partner likes to be asleep by 8 pm. A snore room lets you both have your schedules without disturbing one another. They can also be good for younger parents and breastfeeding mothers. Especially if one works fulltime and the other is a stay-at-home parent – one can get a decent sleep while the other is up and down to the kids throughout the night. Snore rooms can benefit a relationship if one of you is unwell, too. Sleeping next to someone who is sick and restless can be equally as frustrating as snoring. If it’s a head cold or sinus problems, the snoring will be worsened as well. Not a problem if you have a snore room – you can isolate them (or yourself) in the second bedroom and get a good night of rest. Perhaps one of the most famous couples to be advocates for separate sleeping quarters is Queen Elizabeth II of England and her husband, Prince Philip. From the earliest years of their relationship, they have had neighbouring bedrooms with a door in the middle. Considering they are in their 71st year of marriage, the snore room seems like a pretty good idea!